When looking at the new lighting capabilities of QLab 4, if you don’t have access to a lighting rig to experiment with, you really need a simulation of one. This tutorial uses a visualizer, that is reasonably detailed, fun to use, and free! This chapter is not a lighting design tutorial, but, as the chapter title suggests, is a ready built playground, primarily for teaching yourself (or others) how lighting works in QLab. 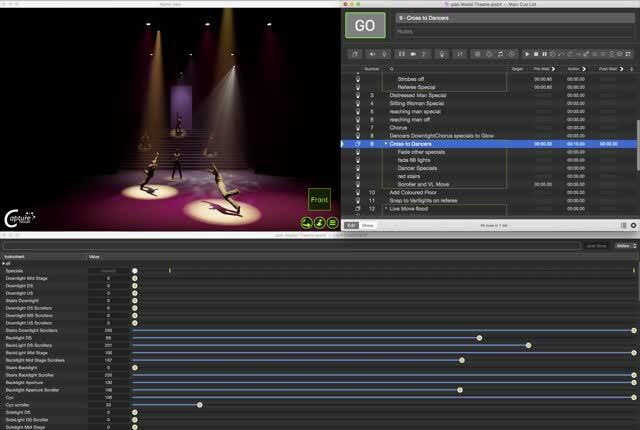 It includes a complete set of working files to visualize, in software, a dramatic theatrical setting, lit by 35 generic fixtures, with old school scrollers, and 4 moving lights which can be controlled by the Dashboard and Light cues in QLab. From the downloads you can get stuck in straight away, creating lighting cues without having to learn a visualizer package. You can then go on to create your own sets and lighting rigs in what is, even in the free version, a very capable visualizer. This is a fully featured lighting visualizer, with Art-Net input, that is cross-platform. There is a limited range of fixtures in this edition. but there are moving lights to play with, trusses, smoke, irises, and gobos etc. Reduced amount of trusses and fixtures in the library. 2 DMX universes can be used. Does not export (DXF or DWG) model files. All console connectivity options are present and fully functional. [The visualizer is running at much less than it’s normal frame rate because screen recording software is running simultaneously]. Here are some stills, rendered directly from the visualizer. Here’s a link to the files so you can create some of your own cues in this workspace and model, before developing your own work. The paperwork is all in the folder together with a QLab workspace and a Capture Nexum File. Here is a list of all the fixtures used in the model. There are 6 downlight specials in open white on the figures in the model, (Ch 71-76). There are four Vari*Lite VL3000 Spots in the corners of the rig with 28 channels of DMXcontrol each,(VL1-4).). The remainder of the fixtures are fresnels equipped with barn doors and scrollers. Each set of fixtures is in a group with a descriptive name. A Quick Guide to getting started. Install Capture Nexum from the download link above. Launch the QLab workspace in the download. Here’s a screenshot of the Capture Nexum with the external DMX showing in the Universes Tab. When you are ready to make your own models and rigs in the visualizer you will have to spend a bit of time with the Capture Nexum manual. Capture is cross-platform and in common with a lot of cross-platform programs has some idiosyncratic non-Mac ways of doing things. You should be able to learn it in a few hours. You can of course run QLab and Capture on 2 separate computers if you have the hardware. You can play video cues from QLab into a Capture model, but it uses CITP rather than Syphon so you will need CITP tool or similar software to convert a Syphon Stream to CITP. The Student edition only has LCD panels, rather than projectors in its fixture list. If you have the full edition you can use projector fixtures (and put all your truss on motors and control them from QLab).